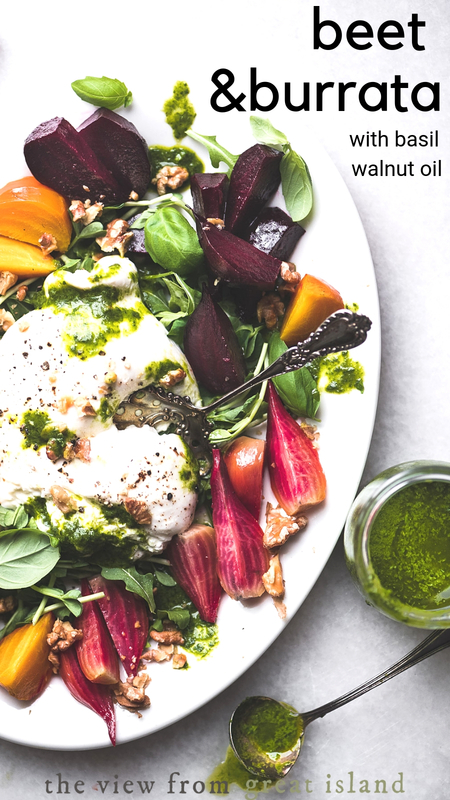 Roasted Beet and Burrata Salad with basil walnut oil ~ this is my kind of food ~ simple, vibrant, healthy…with a touch of mouthwatering decadence. It’s lovely to look at, so satisfying to eat, and I feel good afterwards…shouldn’t all food be like this? What is it about beets? They look so homely and wizened at the store, it gets even worse after you’ve roasted them for an hour in the oven…but once you peel away that yucky skin you’re rewarded with the most buttery, sweet, delicious morsels…why don’t I roast beets every day?? Roasting beets can seem like a chore, but the nice thing is you can do it a day or two ahead, whenever you’ve got a few minutes. The beets will keep just fine tucked into Tupperware, and they’re such a luxury to have waiting in the fridge. I used regular red, golden, and pink Chioggia beets today. The range of color makes this salad so pretty. Each of the varieties has a slightly different flavor, too ~ the pink are the sweetest, followed by the classic deep red, and then the golden. There are also white beets, which are rumored to be the absolute sweetest, but I haven’t been lucky enough to find any. Roasting is my favorite way to cook beets ~ it’s mess free, retains the nutrients, and results in the best flavor and texture. Trim most of the stems and leaves from your beets, leaving just a fringe of the stems at the top. Rinse the beets to remove any dirt. If your beets vary greatly in size, divide them into groups so they’ll cook evenly. Put the damp beets on a large sheet of foil and bring up the foil to form a package, crimping the edges. Don’t stress over this, just crumble the foil so the packet is closed. Put the foil packets on a baking sheet. Roast the whole beets in a preheated 375F oven until the beets are tender when pierced with the tip of a sharp knife. This can take up to an hour or an hour and a half, but it depends on the size. Smaller beets may be done sooner. Let the packets cool for about 15 minutes, then peel the beets. The skins should slip off easily, but if they don’t, use a vegetable peeler. Trim the stem ends off. You can use the beets right away, or store them for up to several days in the fridge. I like to cut them in half and then into wedges and toss them in a little olive oil and salt before packing them up in a glass storage container. 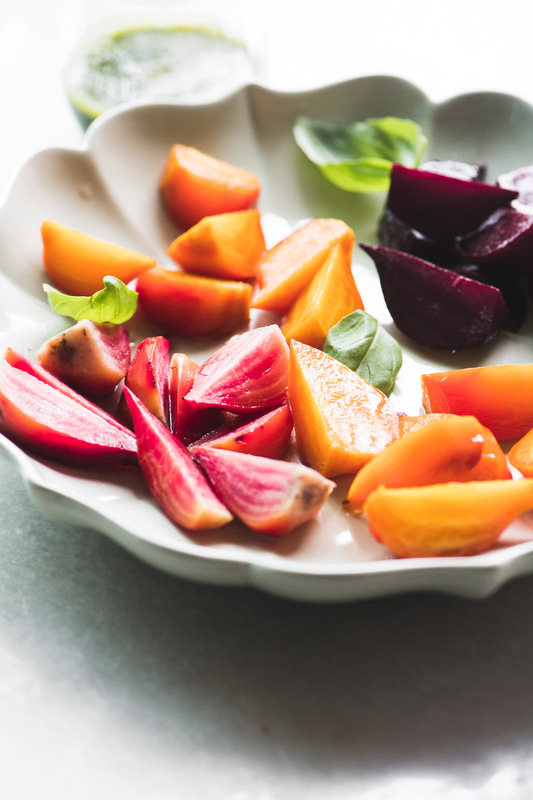 Be sure to separate red beets from golden and Chioggia (pink) so they won’t bleed all over everything. Burrata is a type of fresh Italian soft cheese. It has a mozzarella shell filled with soft curds and cream. It’s famous for having an amazing, sensual texture. 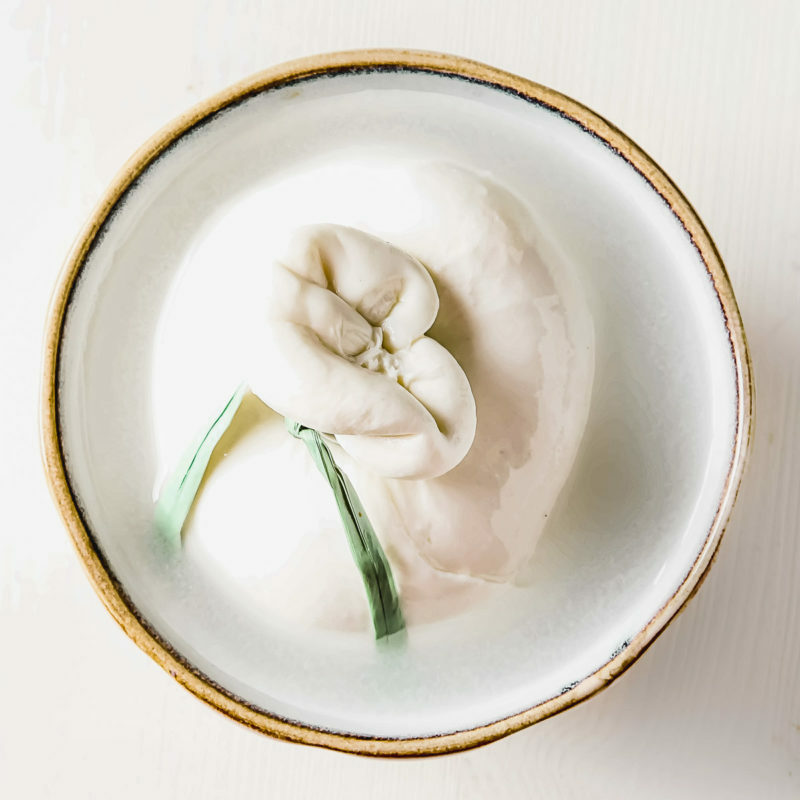 Burrata can be anywhere from soft to completely fluid inside, depending on the way it was made. Burrata is sold as a single ball of cheese, packed in liquid to keep it fresh. It looks a little wonky, if you’ve never encountered it. Where can I find burrata? Most large grocery stores carry burrata these days, and you’ll find it right next to the fresh mozzarella. It will be packaged in liquid, in a tub or little pouch, sometimes with string tied around it. 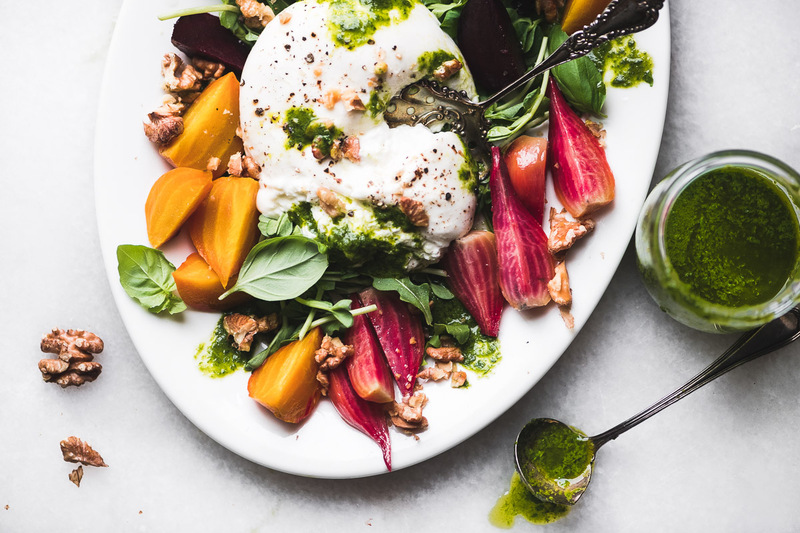 How should I serve burrata? Burrata is often presented like I did here, on a plate or platter in some form of salad. It pairs well with fall figs, winter citrus, or fabulous summer tomatoes. 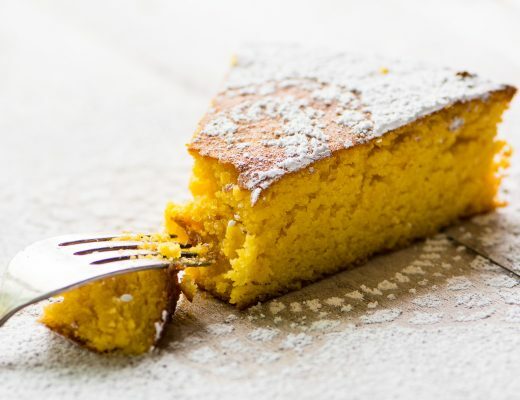 You can simply serve it with grilled bread, or use it to top homemade pizza. Try serving it for dessert topped with juicy roasted strawberries, cherries, or peaches. 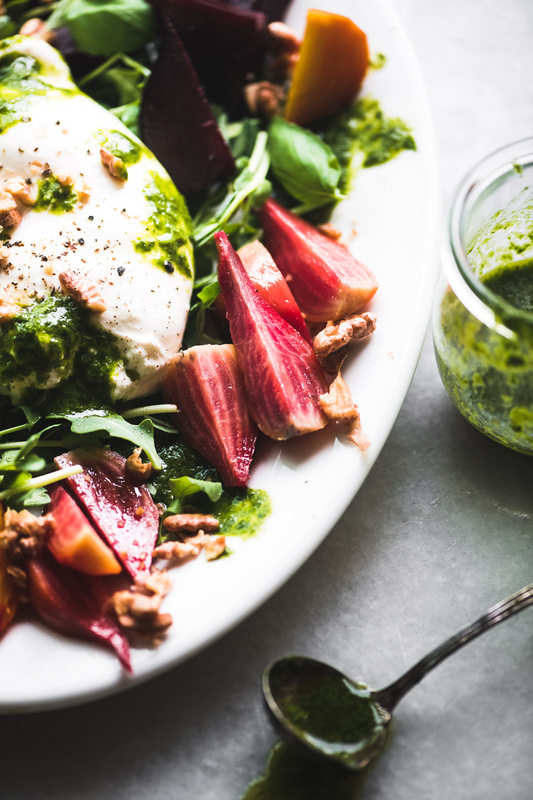 Burrata cheese is fresh, made without preservatives, so plan on serving it within a day or two of buying. The basil walnut oil is essential to the flavors of this plate. 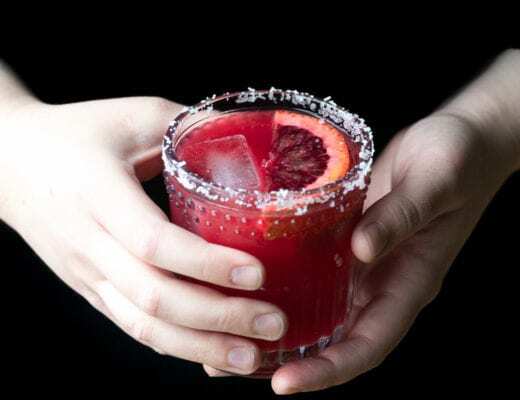 It has a bright zing that contrasts with the creamy cheese and the earthy beets. I whiz together a mix of fresh basil, lemon juice, and walnut oil with a pinch of salt until it’s emerald green and pourable. Simple and scrumptious. I love using walnut oil these days as an alternative to olive, it’s just a nice change. 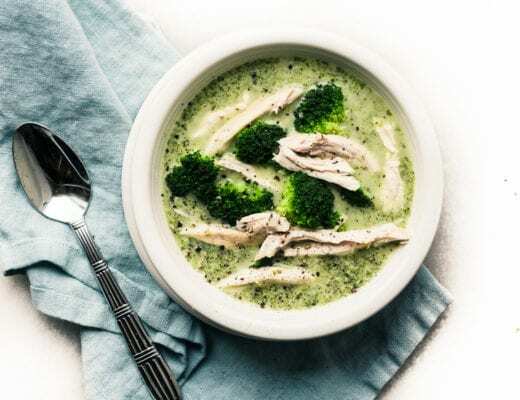 The health benefits are on par with olive oil, but it will give you a totally new nutty flavor profile, which is fun to play with in recipes. One warning ~ walnut oil is not for cooking, it is best used in raw applications like salad dressings etc. And walnut oil spoils rapidly, so keep it in the fridge and use within the year. 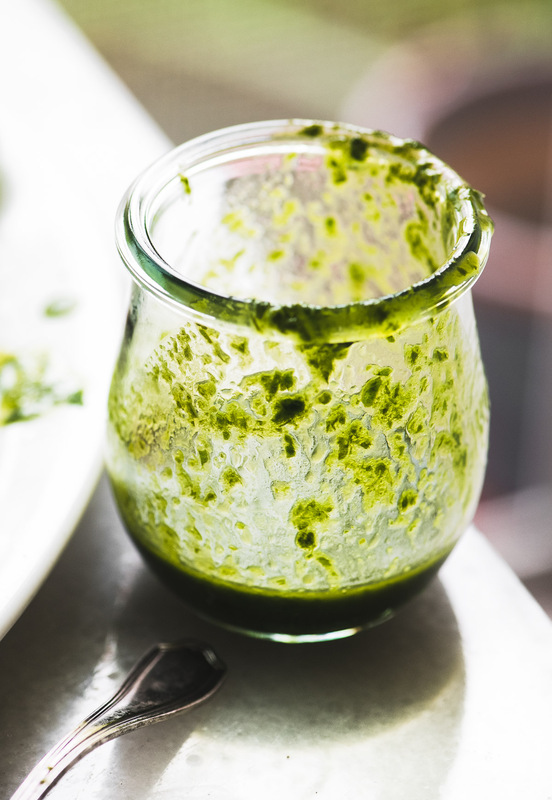 You could substitute pesto for the walnut basil oil, just add a bit more olive oil to loosen the sauce. Gorgeous salad, Sue! 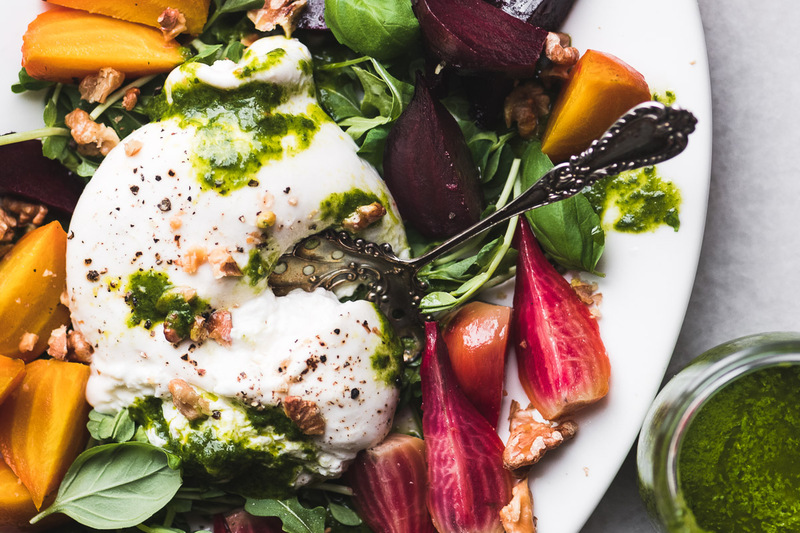 I love the vibrant beets with the creamy burrata! Love beets, and they’re SO GOOD when roasted. And you’re reminding me that it’s been way too long since I’ve had them! Love that you paired them with burrata — nice combo. And nice recipe! Thanks so much. Exactly ~ I had the same reaction after making this, I need to cook with more beets! What a winning sald combination Sue! The colors! Just delicious! 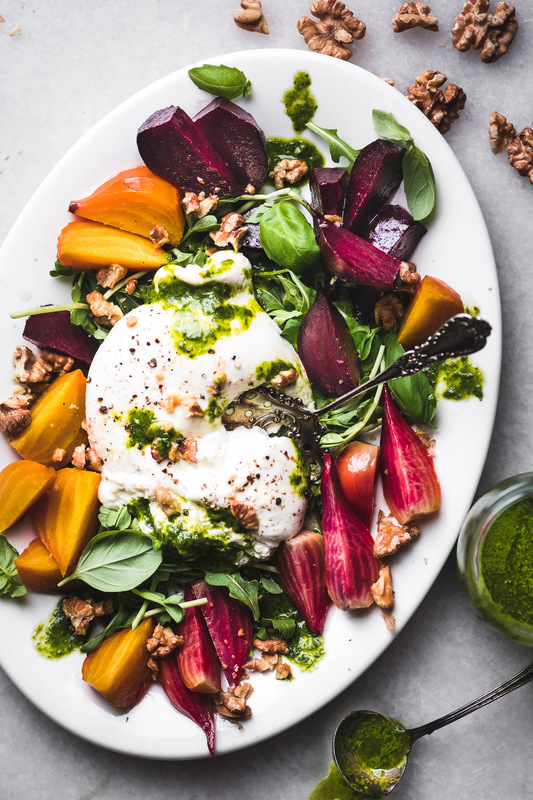 I adore burrata and those colourful beets are just sensational. 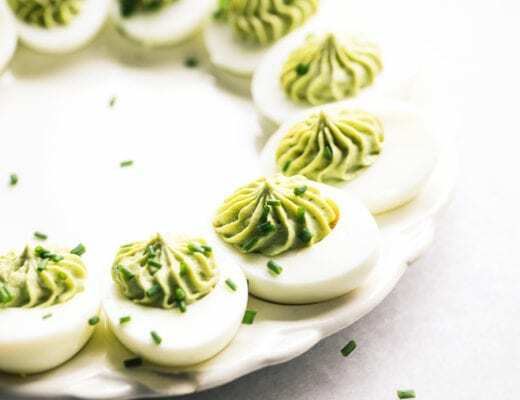 A fantastic combo and beautiful presentation, Sue.